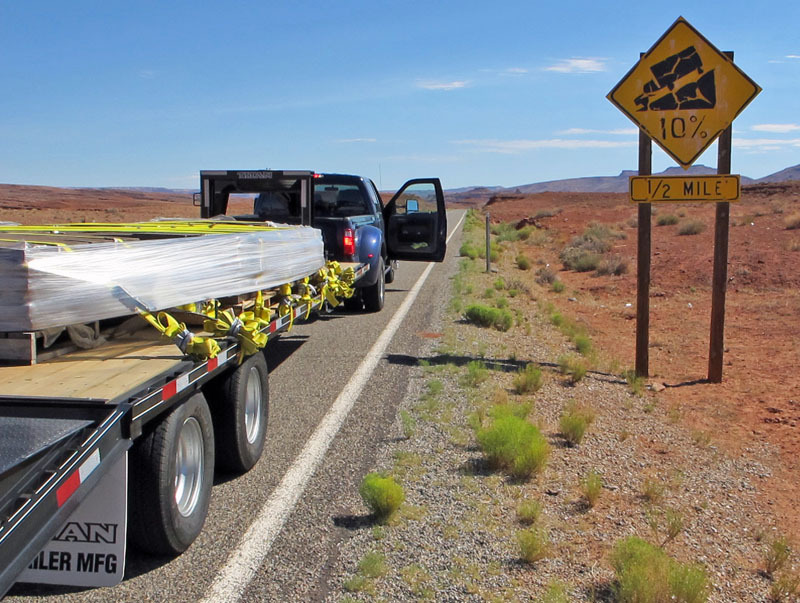 DirecLink ABS for Faster, Safer Trailer Stopping. No Operator Skill Required for Smooth Straight Stops. 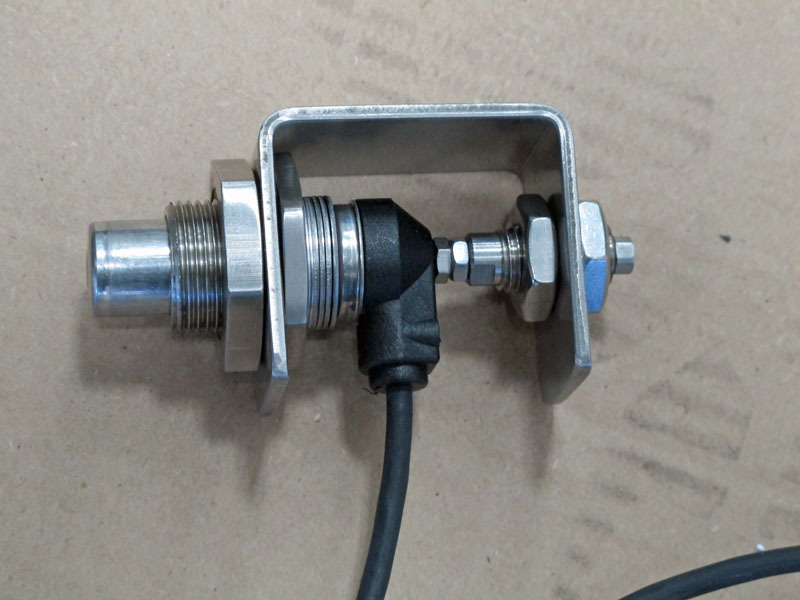 www.TusonRVBrakes.com Finally ABS trailer brakes for fast smooth safer stops on wet, snow and ice roads using electric over hydraulic disk brakes. From Tuson RV manufacture for ActuLink actuator and ABS module. DirecLink trailer brake controller, ABS fast powerful. 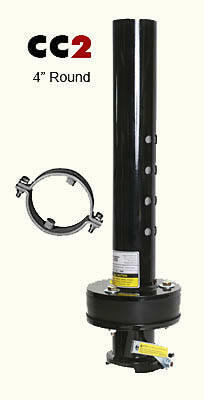 We depend on Anti-Lock-Brakes in our cars and trucks, why not in our trailers. Trailer braking is so important. Hydraulic disc brakes are dramatically more powerful than electric brakes. Now add ABS and you have the ultimate braking system for smooth and fast stopping on dry roads, mud, snow, ice, black ice and the fast side of mountains. I live near the mountains in Colorado and worry about my brakes on trailer trips. 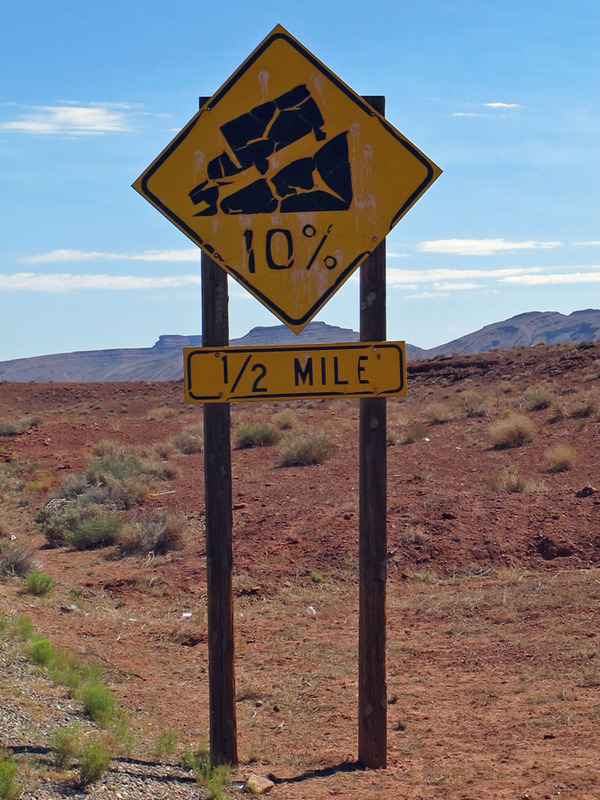 We have our share of high altitude steep highway grades and runaway ramps. It’s downhill you worry about. When I first heard there was a company offering ABS trailer brakes on “smaller than semi trailers without air brakes,” I got excited. My guess is big brother will probably require Anti-Lock-Brakes on all trailers at some point. 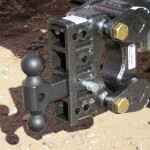 This is the safer solution for ABS brakes for horse trailers, RV trailers, car trailers and construction trailers. 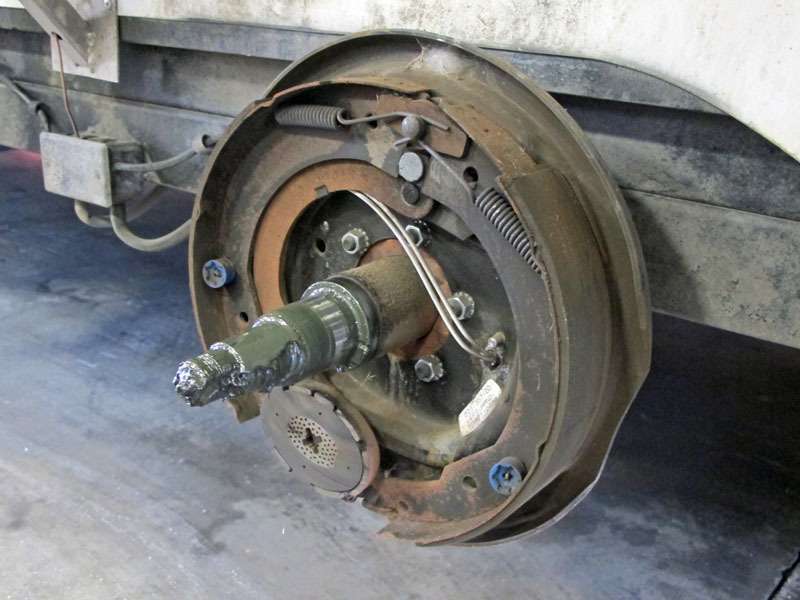 Electric trailer brakes are not known as the best solution, just the cheapest solution. I remember being tickled when Ford introduced the first 4 wheel disc brakes in the 1999 Super Duty model. 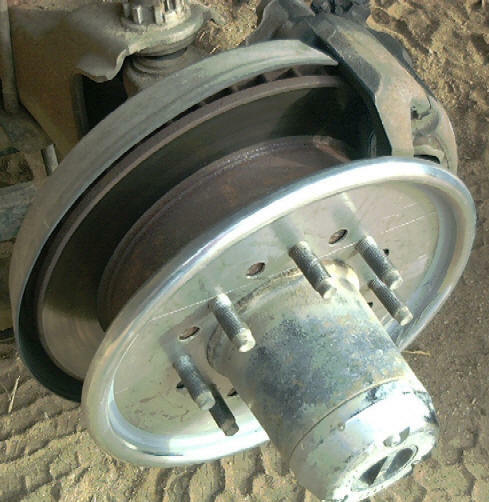 Front disc brakes have been around for decades because of the improved braking ability and 4 wheel disc brakes completed the picture. I liked the rear ABS on trucks in the eighties. With rear ABS, the front was still full braking and the ABS rear brakes kept the truck braking straight. It stopped fast but you couldn’t steer the truck. 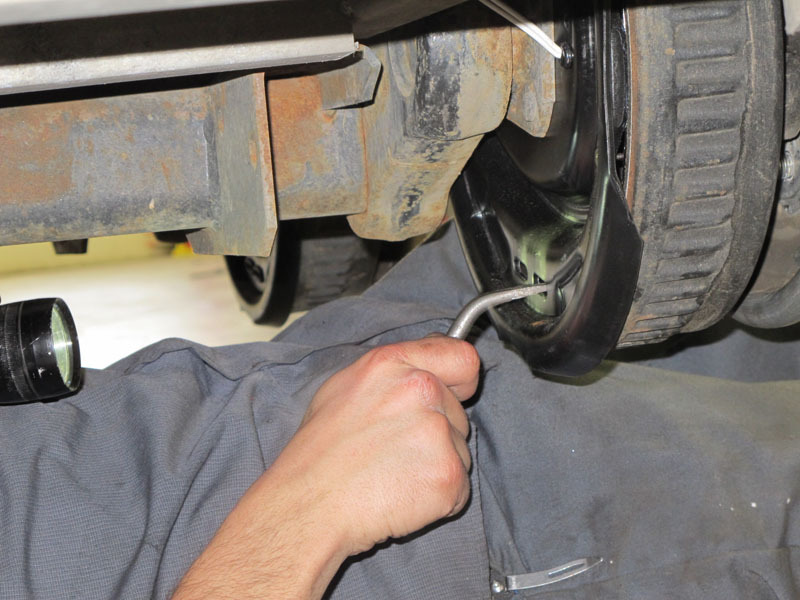 4 wheel ABS does allow you to steer and brake, but the braking is not as powerful. room for safe braking. 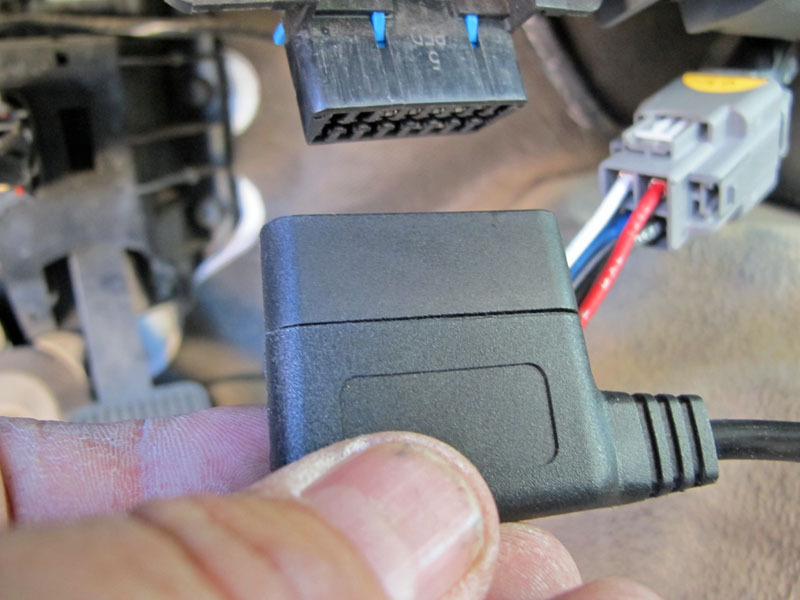 With DirecLink ABS, you can use full brake controller gain with a smooth fast stop. Generally with auto’s the ABS will pulse 16 times per second, the pulsing (off and on with brake fluid pressure) can be as low as 5 times per second with DirecLink using ActuLink which is better braking. You have an initial pull and then skid with normal brakes, with DirecLink ABS, each pulse is a pull. 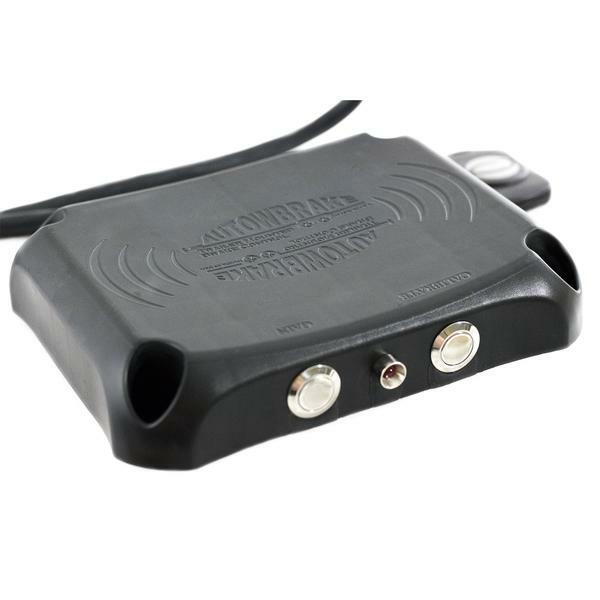 OBD-ll, on-board diagnostic port under your trucks dash, picture below, is the connection DirecLink trailer brake controller uses to network with your trucks computer. No one else does that. 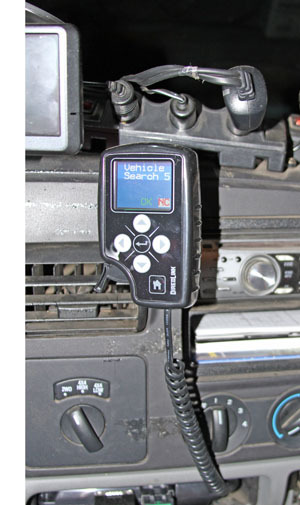 This two way communication ties the truck and trailer together with diagnostic trouble shooting and monitoring. Command Module (picture right below) comes with a couple of dash mounts and will fit anywhere you want to see it. It starts with hydraulic disc brakes. 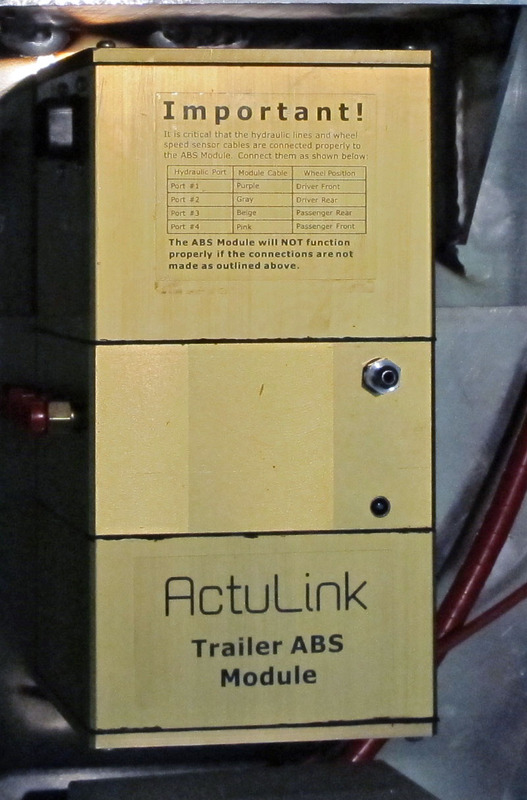 You can convert your hydraulic trailer brakes you have now to ABS with a DirecLink controller, Tuson ActuLink actuator and ABS module. 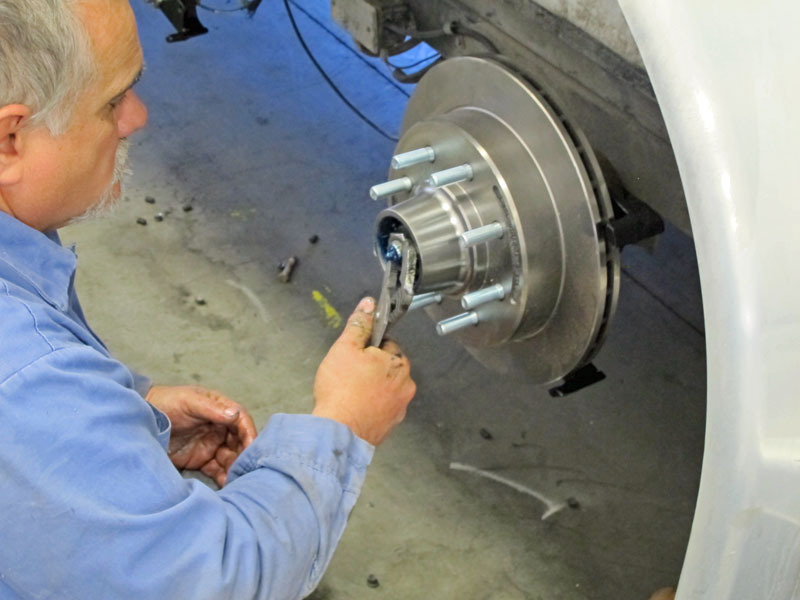 You can convert your electric brakes to hydraulic ABS disc brakes. Or you can order your new trailer with the complete system from a trailer factory. 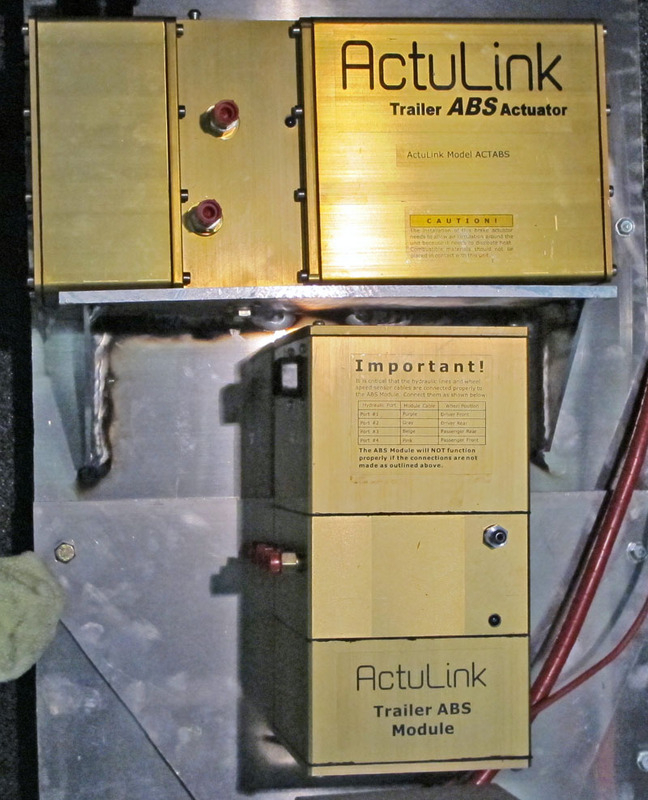 The unique link from the trucks computers digital network communicates to the DirecLink brake controller to the ActuLink actuator to the ActuLink ABS module to apply the trailer brakes. Truck, trailer and brake controller communicating for diagnosis and braking speed management. 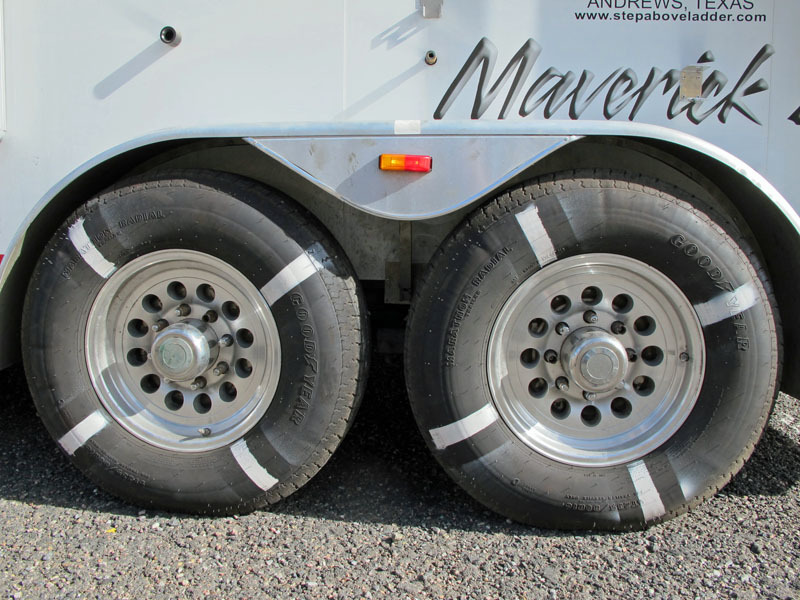 You want the trailer wheels turning during braking, just slower giving rolling resistance. If the tires lock up, they just drag and are skidding not braking. The flat spot on a tire that’s been skidded to a lockup ruins the ride and the tire, it would take thousands of miles on the trailer to wear the flat spot down. By then your horses and you will need therapy. My test trailer is a Logan Coach Maverick 2 horse gooseneck with a 5 ft. short wall LQ. With heavy steel horse expo displays on board, it weighs just under 10,000 lbs with water tanks full. First we replaced my worn electric brakes with new brake assemblies, which gives us new wires, new shoes, springs magnets etc. This makes for a fair test as the hydraulic disc brakes will be new. We burnished (30 times 30 mph 30 %) the new brakes, so we were ready for the brake test at the Bandimere Speedway in the foothills at Morison Colorado. We used a measurement wheel for time and distance which was wired to a counter and then wired to our in cab laptop. We did 3 runs per test and averaged the distance. We tested the trailer brakes on Bandimere straight track for feel and ABS ability on the quarter mile track that was glazed over with spent race car tire rubber. Our distance test was on the track return asphalt road. We accelerated to 60 mph on the smoothest, level part of the road. The wind was slight at over a mile above sea level at the base of the Rockies. 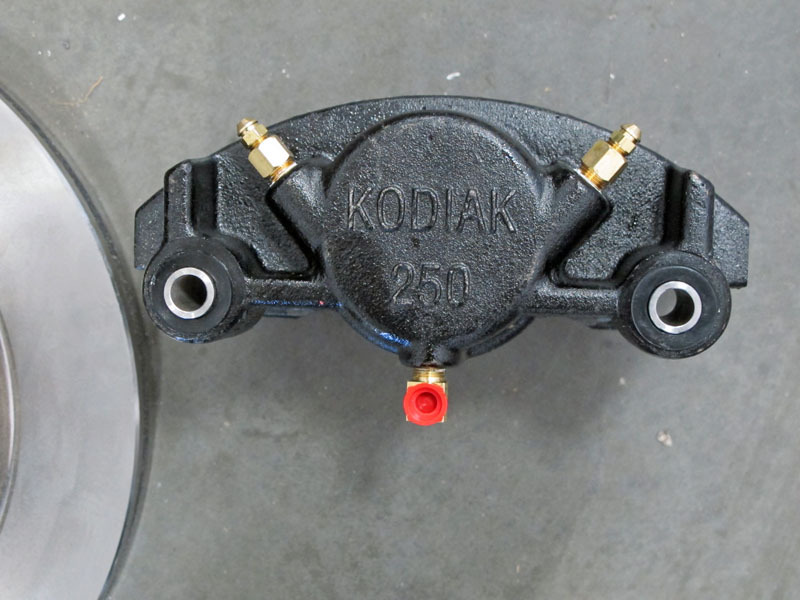 Hydraulic disc brakes are plumbed in, like your truck with steel tubing and rubber hoses. 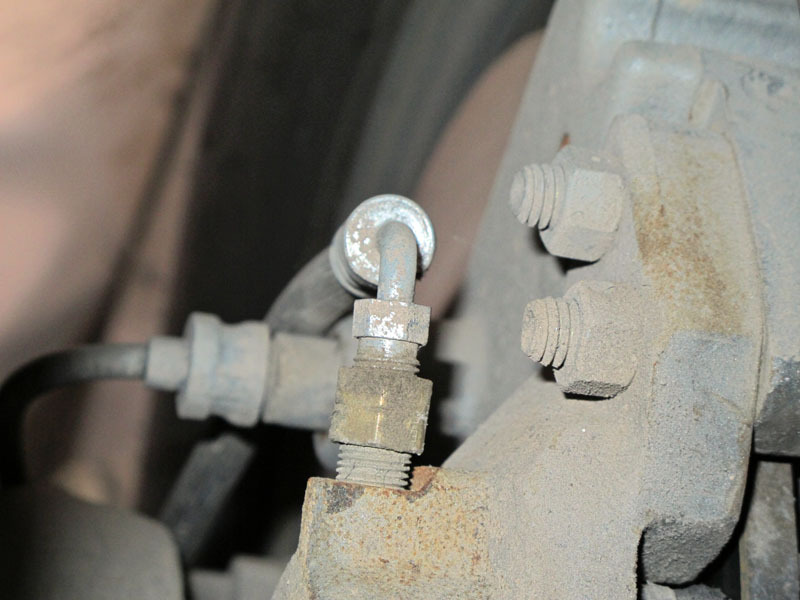 It’s a hydraulic hose at your trailer wheel, not a wire bouncing with your axle. We’re all familiar with the “wire problem” junction boxes, wire connection corrosion. several connections to get to the brake magnet in the wheel. Hydraulics’ are more reliable. I’ve never heard anyone bragging about how good their electric brakes are, but they are cheaper. Hydraulic disc brakes, self adjust, are dramatically more powerful, pads are cheaper to replace and faster. 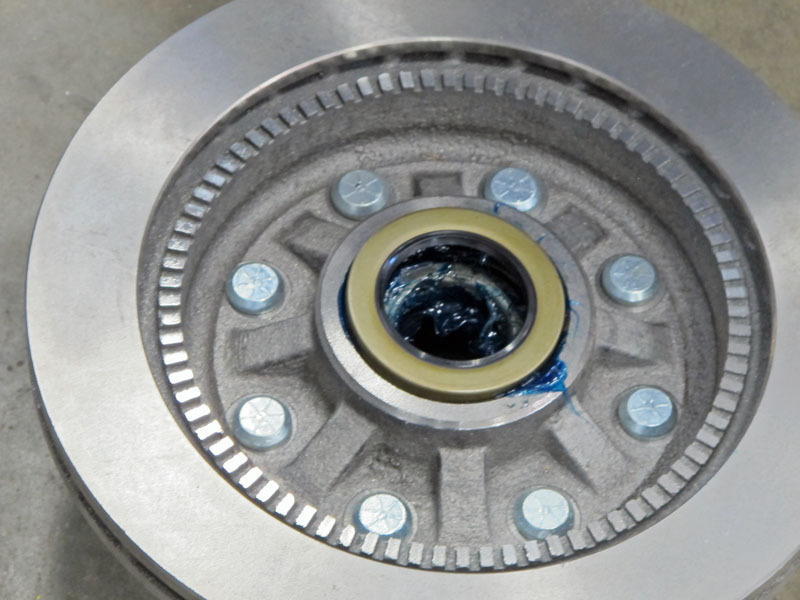 You don’t have to take the rotor off to change pads. There’s a reason modern cars and pickup trucks have gone from drums to disc brakes, even high end RV coaches have gone to disc brakes. What you won’t find is an auto with electric magnet drum brakes or any vehicle that transport humans. 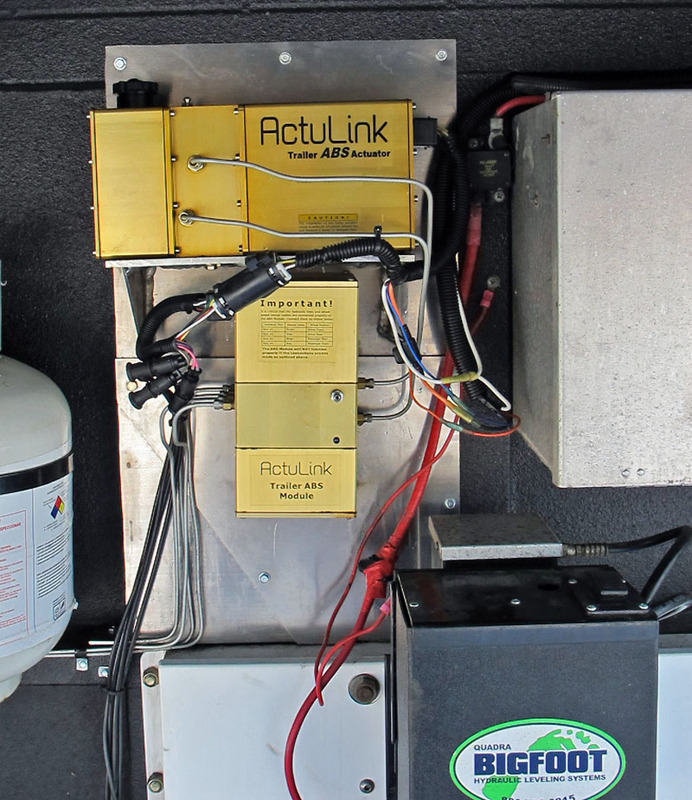 Why you need a better trailer brake controller. 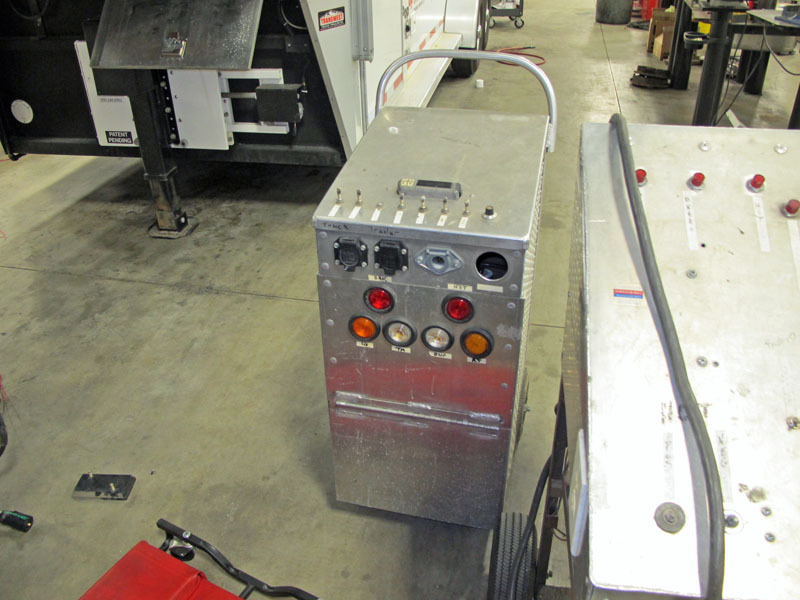 DirecLink trailer brake controller works with electric drum brakes as well electric-hydraulic actuators. 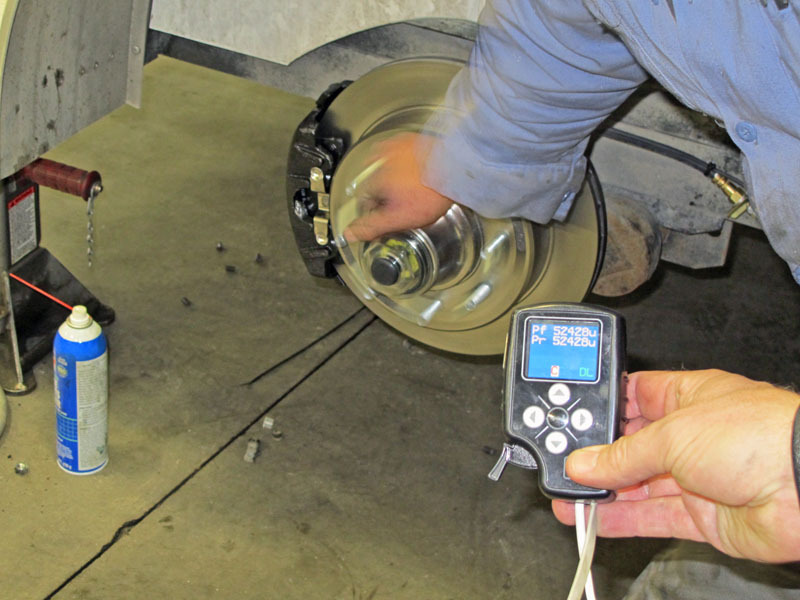 It automatically detects the type of trailer brake you hookup. DirecLink doesn’t have to be installed level. Instead of sensing what your trailer is doing, DirecLink reads the data network of your trucks computer. This constant communication, networks the truck, brake controller and trailer brakes for instant reaction for trailer braking. True proportional braking. DirecLink knows truck speed, so when you’re stopped you’re not running high amps to the brakes. 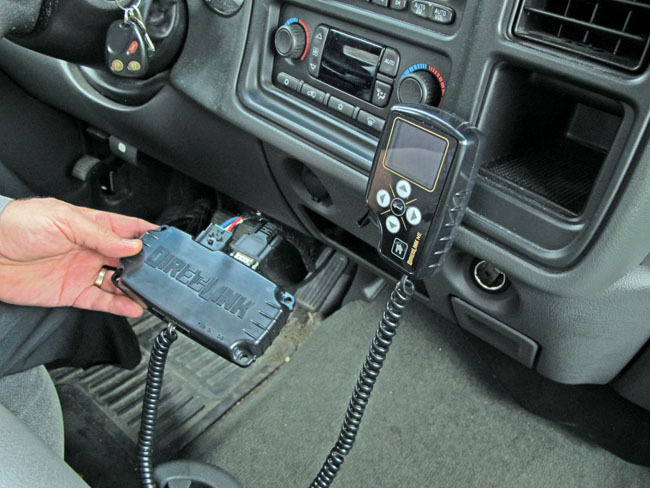 DirecLink monitors wire connections, and warns the driver of any problems making it a great trailer brake controller by itself. DirecLink manual control at eye level in the picture. Keep your eyes on the road. 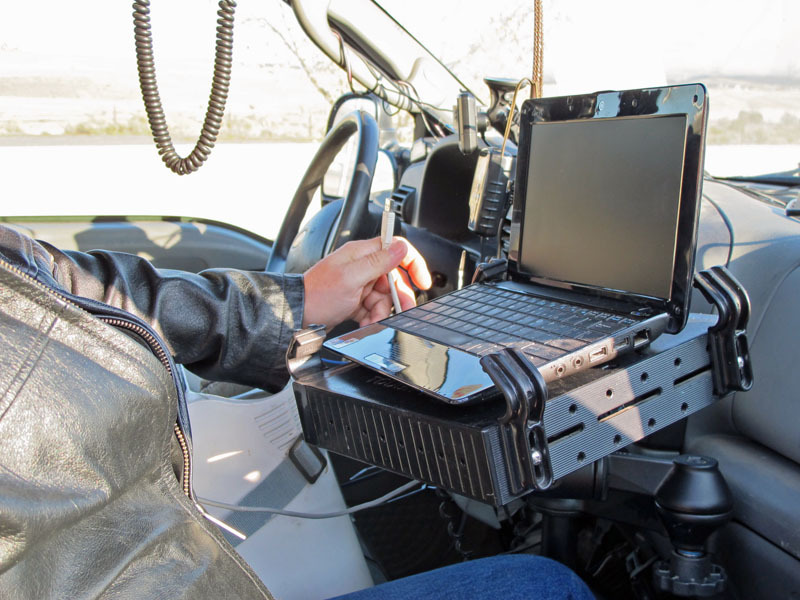 In my testing truck and trailers, the only time I got into trouble looking at all the devices I have in my cab is if they were mounted to low and my peripheral vision couldn’t see the road. Each component with DirecLink and ActuLink continuously self-monitor and reports any problem to the screen on the Command Module brake controller. There are more than 30 parameters constantly being monitored. 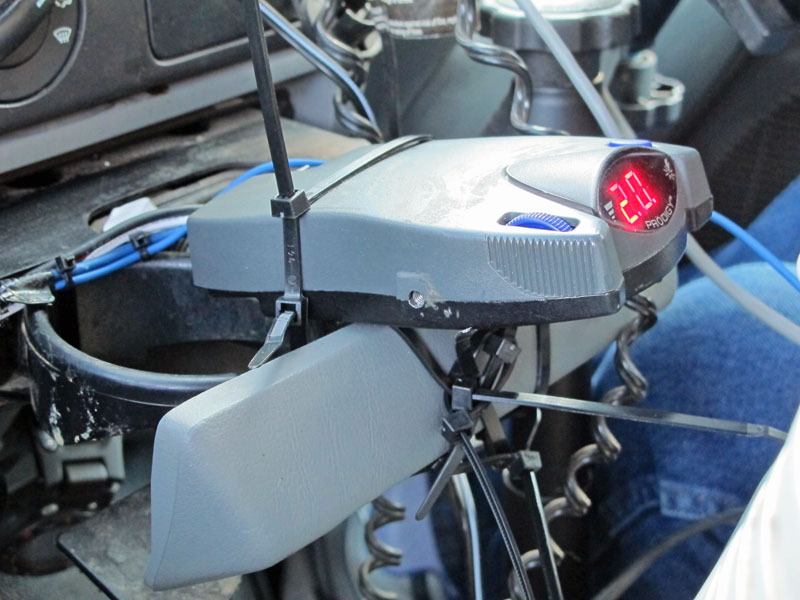 DirecLink with, adjustable screen brightness, gives you amps, voltage, controller temperature, connected to trailer, brake light voltage, vehicle battery voltage and more. 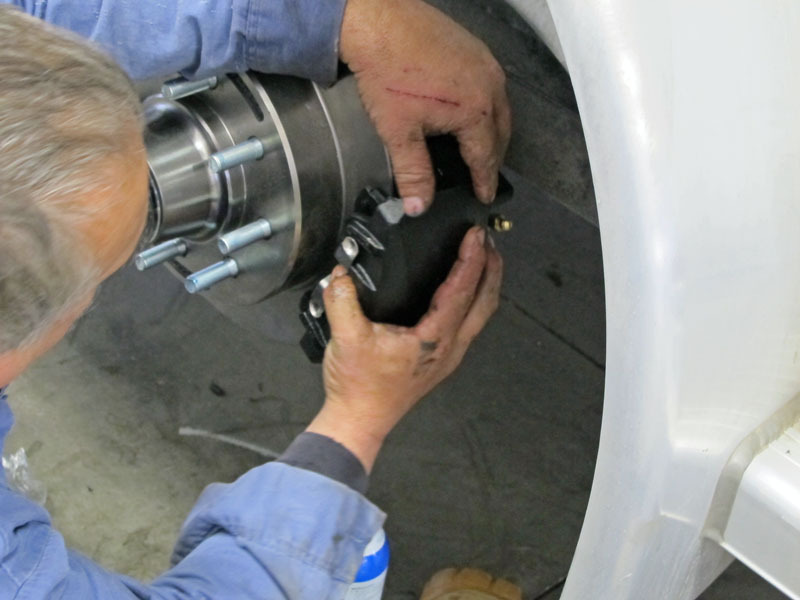 All settings can be done on the go, velocity compensation, faster, slower, more brakes etc. DirecLink knows how fast the truck is going or slowing compared to the Prodigy controller and other accelerometer based controllers having to sense motion to engage trailer brakes. My experience with DirecLink NE ABS with full brakes using manual override or maximum brake level, didn’t lockup, it was so smooth. No whiplash or road rage, with each wheel braking separately by road surface, the trailer is much more controllable. Usually you can’t use maximum gain on a controller unless in an emergency because of the erratic bucking. 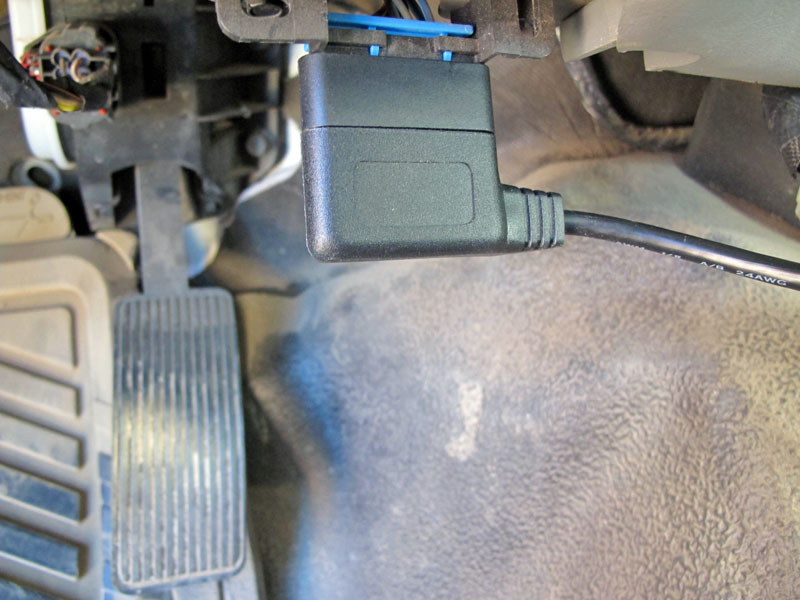 DirecLink, brake level when stopped is adjustable from 5 to 30%, nice if you stop on big grades, boat ramps etc. 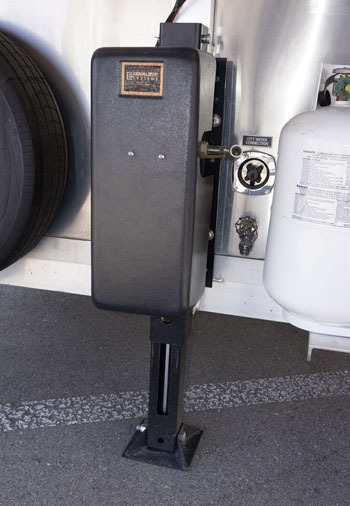 If you use the DirecLink on a trailer without ABS, electric or hydraulic, you can adjust the maximum brake settings. 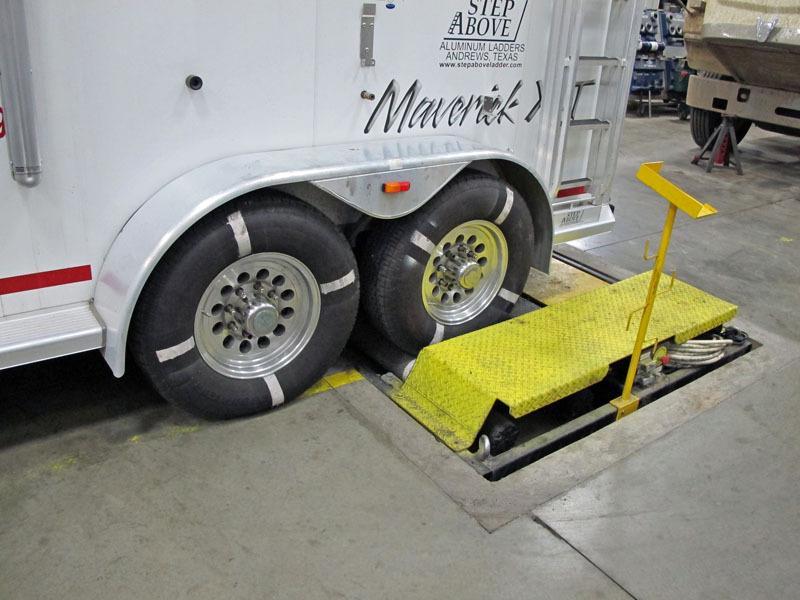 If you have trailer wheel lock up at for example 80% of maximum trailer brake, you can set the max brake settings to top out at 75% and avoid wheel lockup and flat spots on your trailer tires. The DirecLink is also able to check amps on electric brakes to each wheel allowing you to double check you trailer brakes. It’s so adjustable, easy to plug in and set up, you can set a couple things and forget it or adjust 400 controller settings and configure it to tow space shuttles. There are two models, one for regular brakes, DirecLink and DirecLink NE for ABS brakes, both are a two way digital network with the trucks computer thru the OBD-ll port, nobody else has it. With DirecLink the brake scale (gain) has two settings, one for medium trailer 1-20 or large trailer setting goes to the next 20, so 40 gain settings. And low speed brake setting of 10 in each of the 40. You can dial in the settings like a rocket scientist or not. With the low speed setting, you can adjust the brake level for slower, lighter stops. I have mine set so the brakes come on soft and ramp up fast. Using a velocity compensation factor gives you more braking at higher speeds, because the DirecLink is reading the trucks speed from the OBD-ll port. 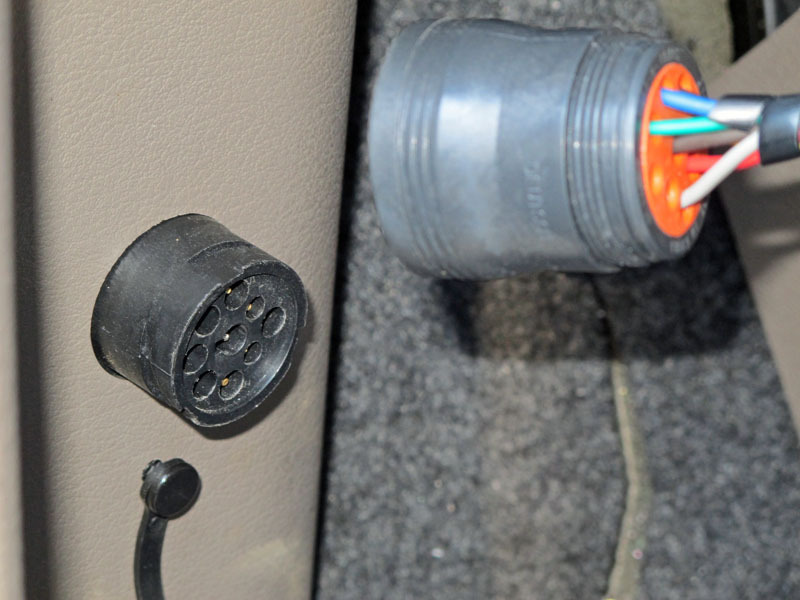 Two power sources and grounds to the DirecLink controller, one from the truck OBD-ll port and one from trailer wiring harness which increases reliability. 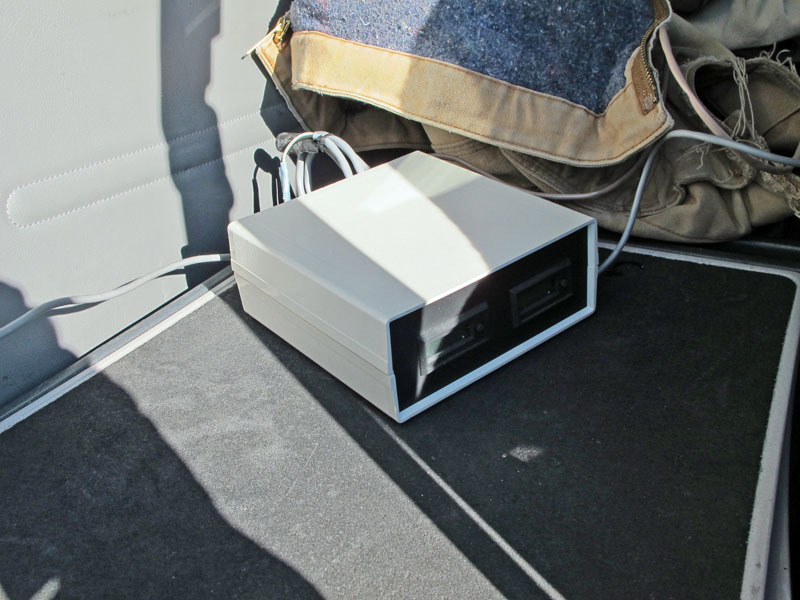 We used the Prodigy trailer brake controller for comparison in our brake tests. Using the Prodigy manual override lever didn’t turn on the trailer brake lights. The DirecLink did. I would think anytime I use the brakes, I want lights to come on behind me. In all tests, brakes and controllers were adjusted for maximum braking. 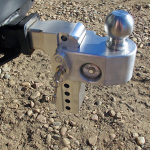 The DirecLink trailer brake controller is a fast install. 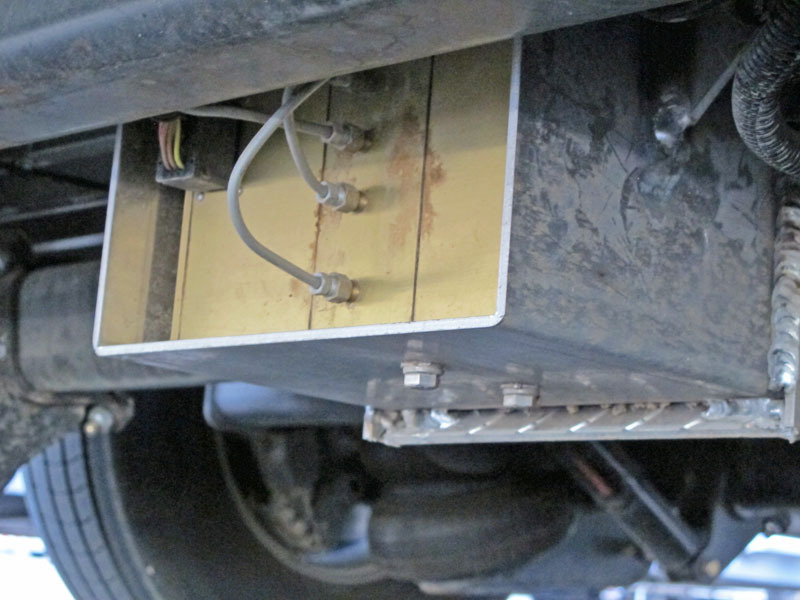 Normal 4 wire trailer connection, DB-9 to OBD-ll The Control Module can be installed under the dash so only the Command Module can be seen. It looks like a CB, which is more accessible. I put mine towards the top of the dash at eye level. All the controls are in the Command Module with arrow buttons and menu. 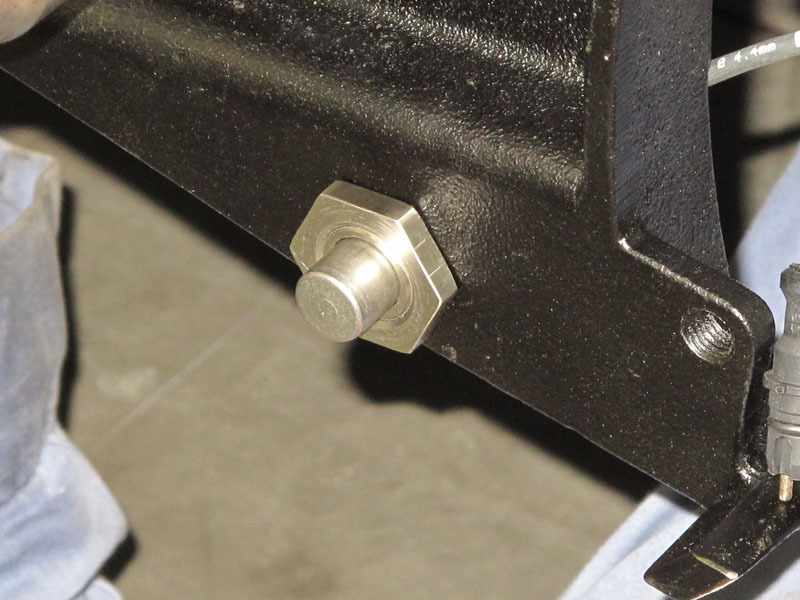 The manual override lever is there also for applying trailer brakes independently, making if faster to use than you see with most trailer brake controllers. The hand held controller is simple to adjust on the go, mount at eye level or attach where you want it for diagnostic readout and warnings you can see on the go. You can a get a dual OBD-ll adapter to run DirecLink and a Edge, Superchips or any of the performance programmers along with the DirecLink. Reading digital data from the truck to DirecLink will be the same all the time, with other brake controllers that use accelerometer (motion detector) or pendulum can have a different reading each time you brake depending on a rough road and bouncing trailer. Another problem DirecLink solves, with semi trucks, the truck movement while braking (decelerating) is less dramatic than pickup trucks. 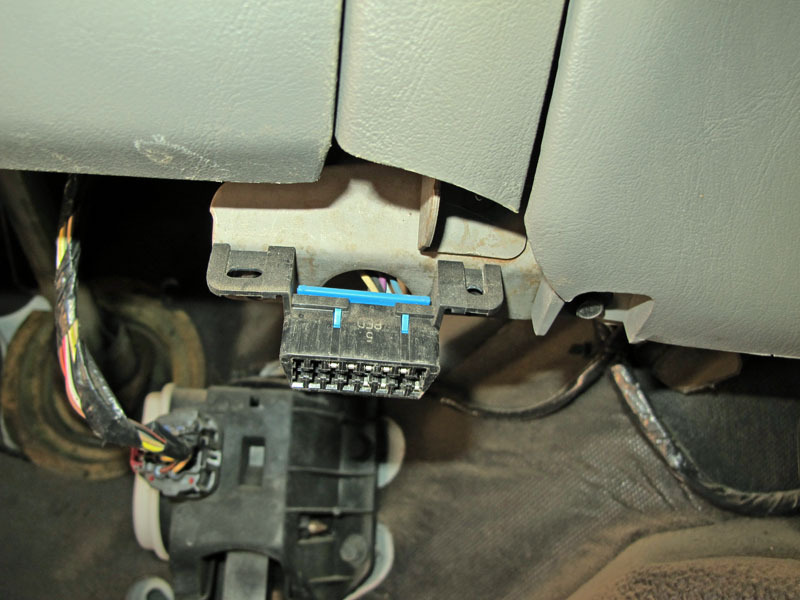 This causes problems with accelerometer type trailer brake controllers as that motion is what makes them work. DirecLink controller doesn’t use accelerometers (motion) but networks with the trucks computer so it knows the trucks speed and deceleration for braking the trailer. 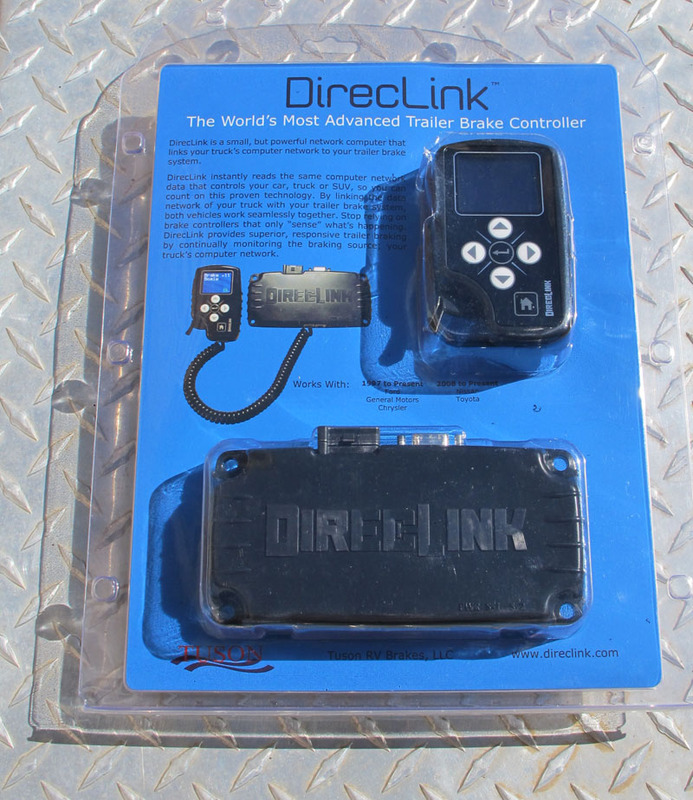 Freightliners, Volvo, International, Peterbilt and Kenworth can use DirecLink trailer brake controller for better braking of the trailer and less wear on the trucks brakes. 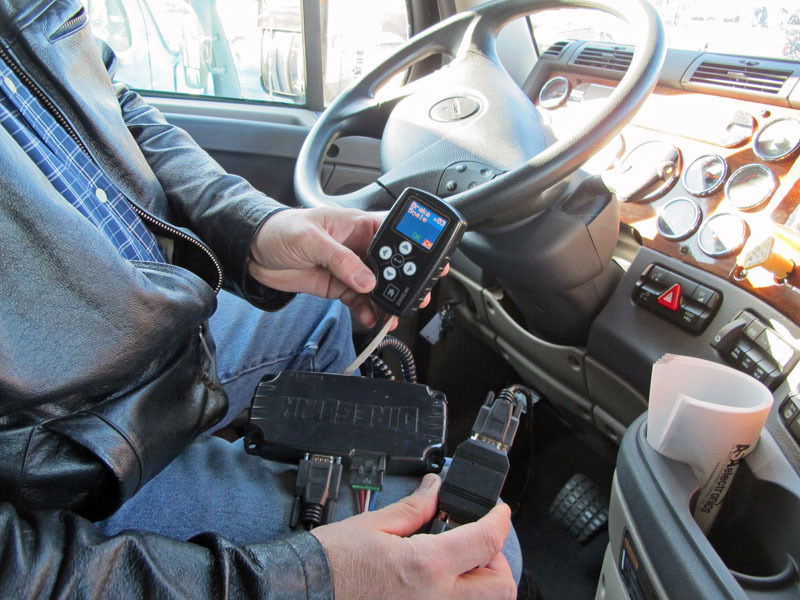 Picture right, a Freightliner Cascadia engine diagnostic port, like the OBD-ll on pickup trucks and SUV’s for networking trucks computer to DirecLink NE controller. Picture left, ActuLink actuator with 1.1 liter fluid reservoir, puts out 1600 psi. How it works; electric hydraulic actuator, pump and motor, electronic board, input output pressure and return line to ABS module. When the ABS pulses, it releases the brake pressure so you have to have a return line for a closed loop. Four independent hydraulic lines come out of the module, 4 channel, each wheel senses and reacts independently, pulses separately. Tone rings inside the brake rotors enable wheel sensors to monitor each wheels speed. As wheel comes down in speed nearing lockup, ActuLink module releases pressure and re-applies to keep each tire at maximum rolling resistance for maximum traction. Fluid level sensor in reservoir displays on DirecLink, if fluid is low or is out, you get that warning. 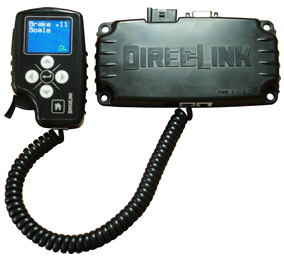 DirecLink Brake Controller plugs into the Control Module which plugs into normal 4 wire trailer tow package harness and OBD-ll port both under the dash. It doesn’t just pulse, it monitors wheel speed, monitors deceleration and acceleration for optimal levels. You won’t flat spot your tires with hard braking, so your tires last longer. 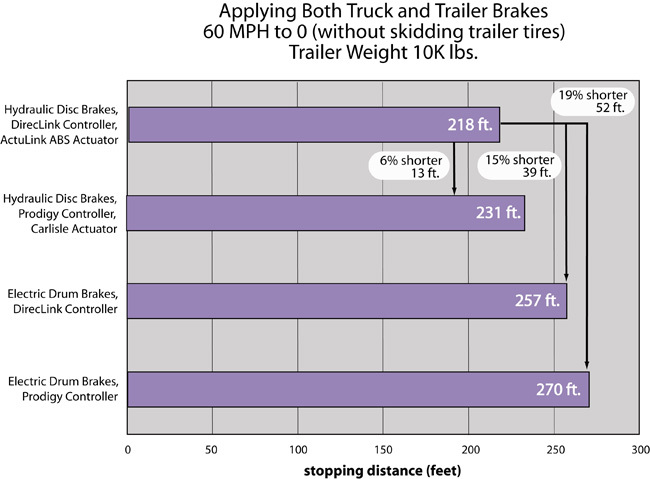 The ABS pulsing of the trailer tires stops 10% shorter on dry pavement and 20% shorter on wet pavement than skidding the tires in full lock-up without ABS. 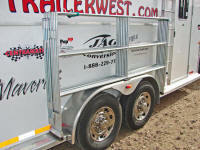 It also keeps the trailer directly behind the truck, preventing trailer slide-out. DirecLink controller doesn’t have an accelerometer, so it doesn’t have to be installed level like most of brake controllers. 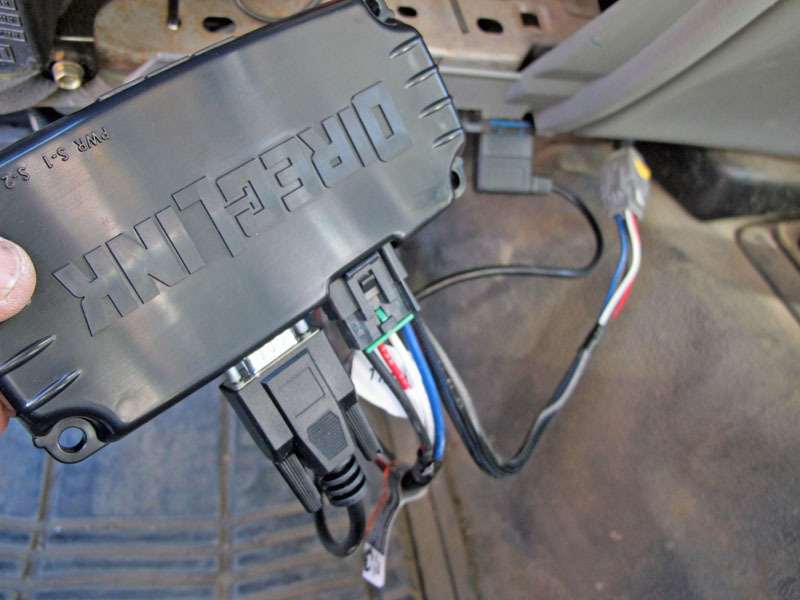 The controller is easy to install, plug it in, start your truck, touch brakes and it powers up, finding the vehicle brand (GM, Ford, Ram, Toyota and Nissan) network automatically. Goes to brake scale if it shows green OK, ready to go, connected to truck, connected to trailer. For town, low speed brake setting, adjusts minus 5 to plus 5 just once. On GM and Ford the DirecLink will also give you transmission temp. 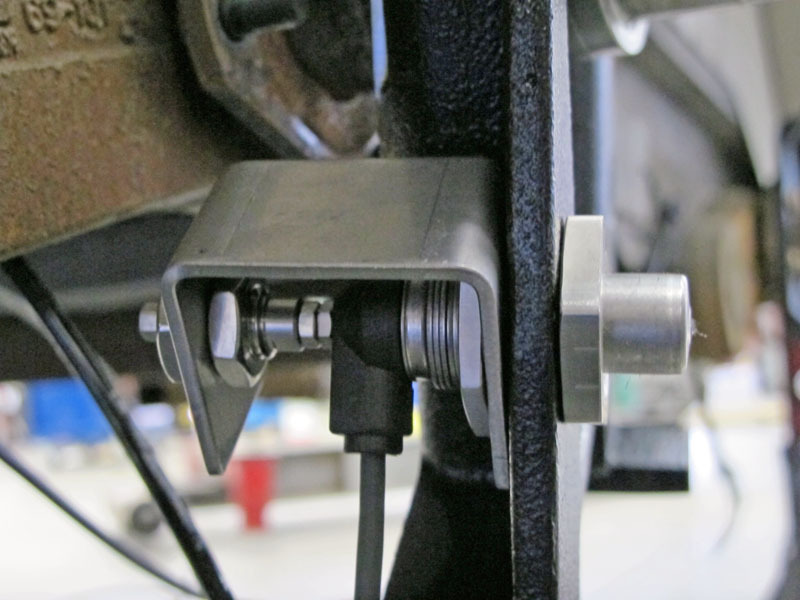 As fast as the truck hydraulic sensor used in some trailer brake controllers. 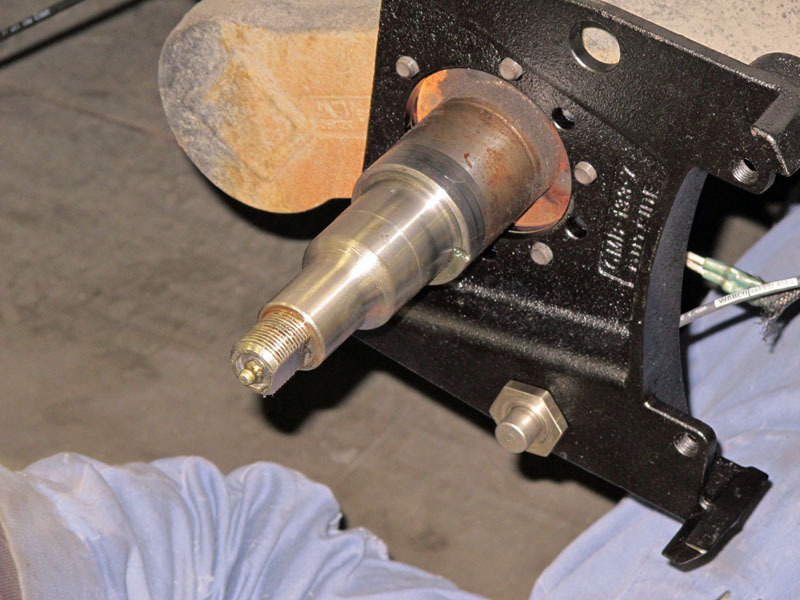 Hydraulic brakes are powerful, dramatically more than electric brakes. But it takes some weight to control it. 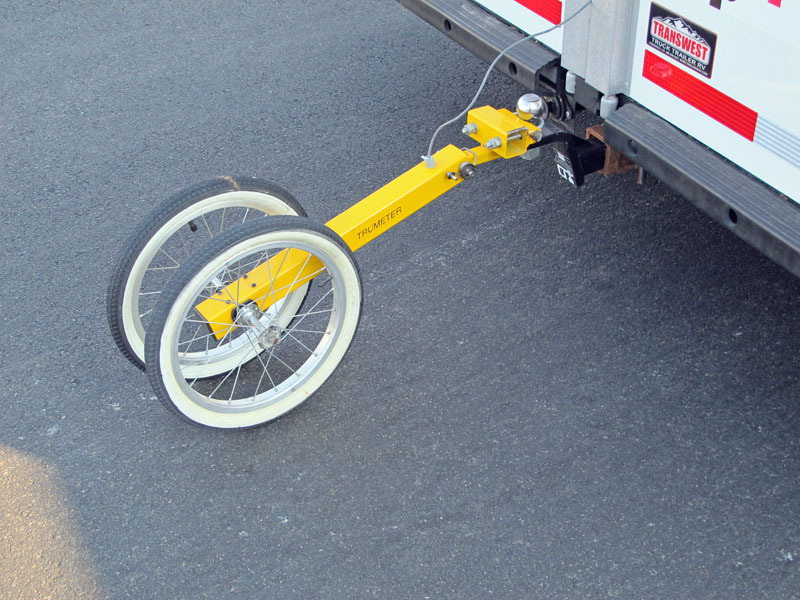 A light trailer will lock up the brakes with hydraulic discs. 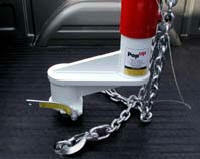 But with DirecLink, it doesn’t lock up, so can use it on any trailer. Much safer for empty as well as loaded trailers. 5 ABS pulses per second most auto’s are 16 but 5 will give you more road contact thus more braking. DirecLink has power and ground from both directions. Most brake controller can loose power from trailer and they are dead. DirecLink does diagnostics, black wire, low voltage, DL mode, direct link, digital message back and forth. black wire voltage is low, when you fixed problem, it will tell you. 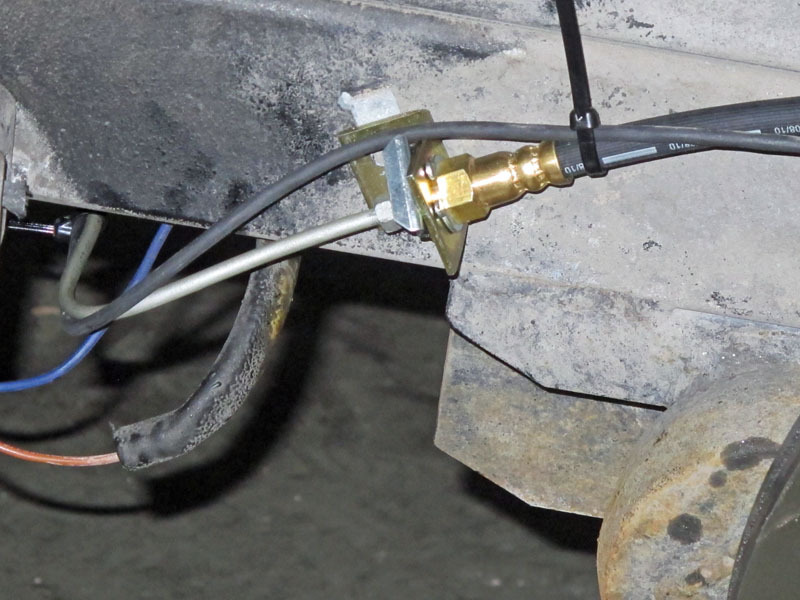 Ground is a problem with most brake controllers, with DirecLink, it will tell you if open ground, blue wire short, trailer harness worn through etc. Red warning and beep from the DirecLink controller; will switch from network mode to PWM conventional mode if the connection is bad. It tries to always have working brakes even with a poor connection. 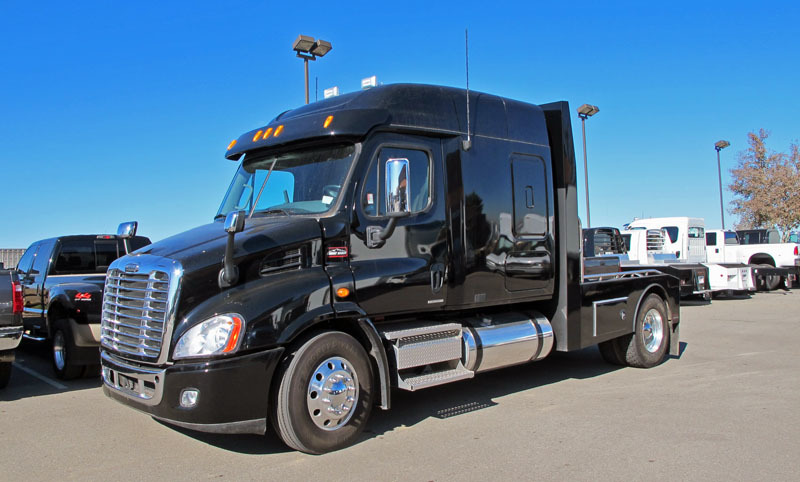 Other things you can use, truck battery charging, brake voltage, temperature sensor for electric brakes, amps thru the blue wire, actuator temperature, will still pulse but controls temperature, so the controller doesn’t get damaged, power save mode, truck RPM, MPH. Has actuator data like, voltage drop, bad ground, real time test for wire integrity. fluid level OK, low or out, shorted or not connected. But wait there’s more, actuator temperature, vehicle battery and trailer battery volts, abs diagnostics, checks wheel sensor, pressure transducer, with manual override, you can see brake pressure which can tell you if you have air in the system. With the fault screens, you can find, by slowly building pressure, the exact problem, call Tuson and they can assist in diagnosing your exact problem with help from the screen display. DirecLink controller can tell if you have a flat tire (smaller tire spins faster), it will tell you “right front tire low.” Tire pressure monitor is coming in the future. The emergency breakaway cable is wired to the ActuLink actuator. 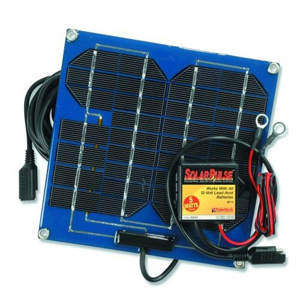 It will apply your trailer brakes for about 20 minutes with a charged battery. Road Simulator at Transwest Truck Trailer RV to measure brake force. We used Transwest Truck Trailer RV’s facility in Fredrick Colorado. I had the trailer tech’s inspect the drums to see if they needed turned or replaced. 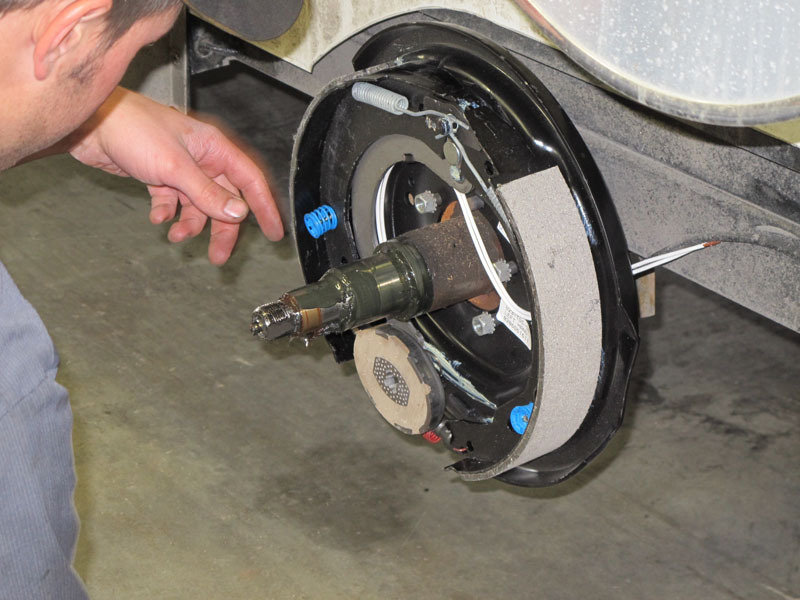 They installed the new electric drum brake assemblies, adjusted the shoes and then we tested the brakes on the Road Simulator for rolling resistance and brake force on Transwest Truck Trailer RV. Brakes were tested at Bandimere Speedway for a day, back to Transwest for new Kodiak disc brakes and DirecLink-ActuLink ABS from Tuson. 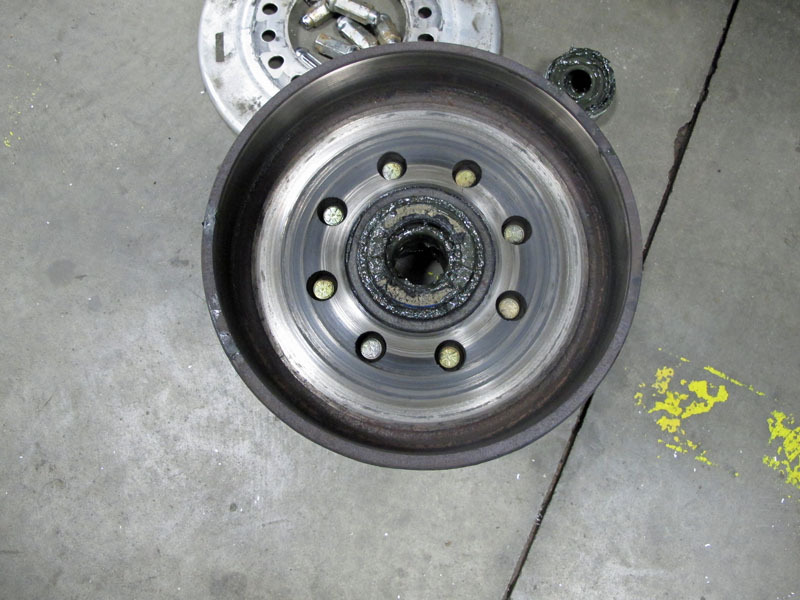 In one day of brake testing with the new drum brakes, the heat ruined the new drum seals (picture left). Next day we installed the Tuson ActuLink electric-hydraulic actuator and ABS module along with new Kodiak disk hydraulic brakes. 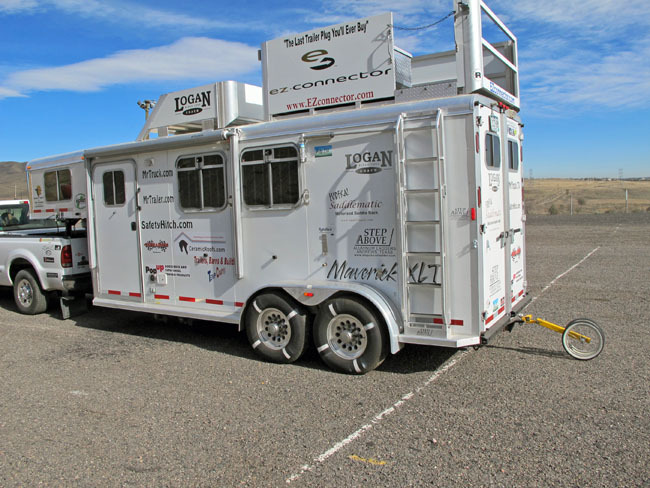 Transwest Truck Trailer RV has specialized equipment to test and fix trailers besides the Road Simulator. 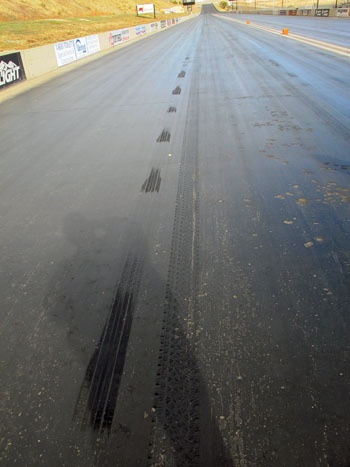 At the slick track at Bandimere Speedway, with rubber from a season of racing still on the track, made a great surface for demonstrating ABS trailer brakes. Trailer marks (left) show the trailer not locking up. Each wheel was rotating independently giving dramatic braking on a slick surface. 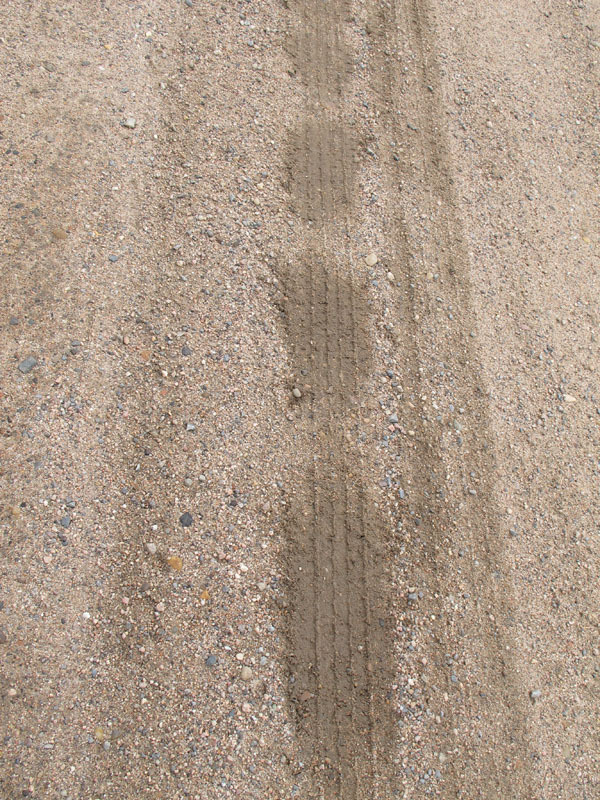 Right picture is on a gravel road, showing again the trailer braking was not skidding wearing a flat spot, but stopping with the pulse from the ABS ActuLink module. This is what will allow you to stop on ice, mud, gravel, snow and rain like never before. 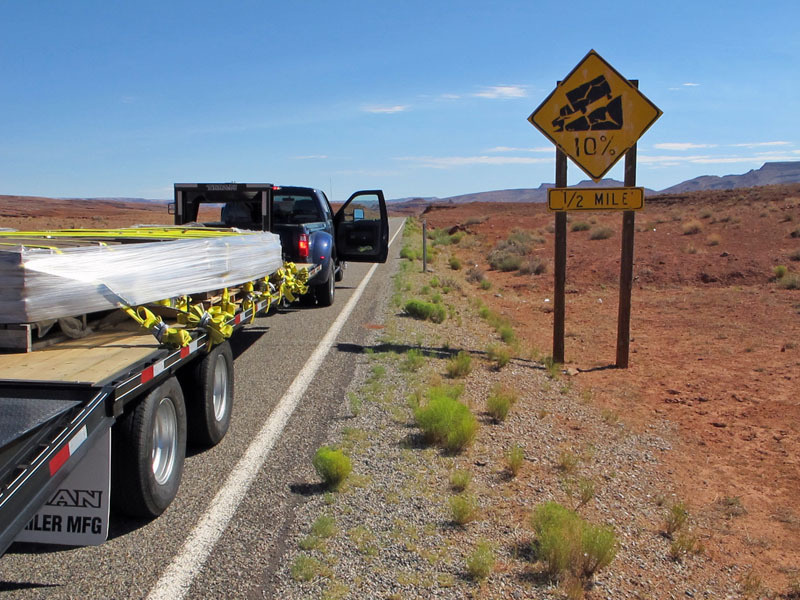 With a large investment in your truck, trailer, tack and horses, stopping on a dime to avoid an accident will make your family happy you invested in trailer ABS. DirecLink ABS system will work with up to 4 axles. Middle axle of 3 is a slave, sensing on if front or rear will lock first based on suspension type. 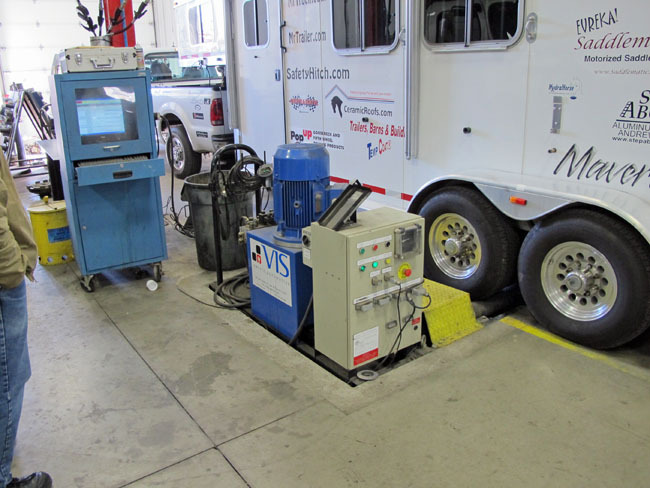 We used Transwest Truck Trailer RV’s shop to install the trailer brakes and use their Road Simulator. The RS can test brake force, axle weight, rolling resistance, weight balance and steer axle fittings. After we added the new electric brake assemblies, we put the trailer on the Road Simulator and all 4 wheels passed. Then adapting the trailer to Kodiak disc hydraulic brakes and ActuLink actuator and again passed the Road Simulator decelerating and brake force tests. Interestingly, the maximum brake force from the hydraulic disc brakes with the ActuLink ABS actuator and DirecLink trailer brake controller had almost twice as much braking force or the electric drum brakes had close to 1/2 the brake force of the ABS hydraulic disc brakes. The hydraulic disc brakes put out 4084 lbs of brake force on two axles. 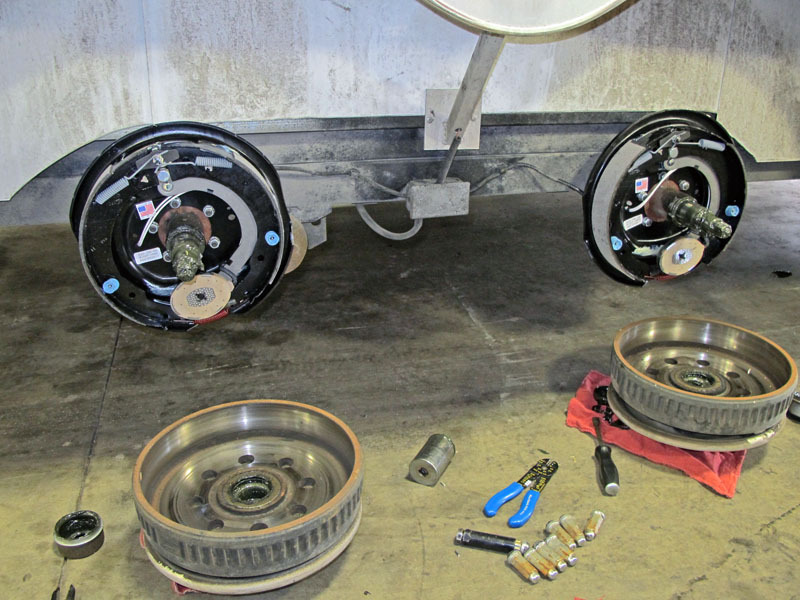 The electric drum brakes put out 2126 lbs of brake force from both axles. We have braking test results from Bandimere Speedway below. We used the MrTruck.com test mule, a 2006 Ford F250 diesel and the 2010 Logan Coach gooseneck horse trailer. We used two trailer brake controllers, DirecLink and Prodigy and two hydraulic brake actuators, Tuson’s ActuLink and Carlisle. We used an external thermometer with laser to check brake heat. We got the brakes hot, braked several times with each trailer brake controller. Our goal was not to lock up the tires and be as aggressive as possible on braking. DirecLink was smooth but grabbed at the beginning. We set it near maximum brake level (gain) at 18 in large trailer mode plus 3 setting for low speed set. The Prodigy at maximum 13 gain and 3 for boost, was wild and bucking. Both controllers chirped at the end of the run so we knew we were close to locking up the tires. Prodigy smoked the electric brakes with manual override control, lots of smoke. The seals got hot enough to leak grease out the rubber seal and where the seal steel seats into the hub. 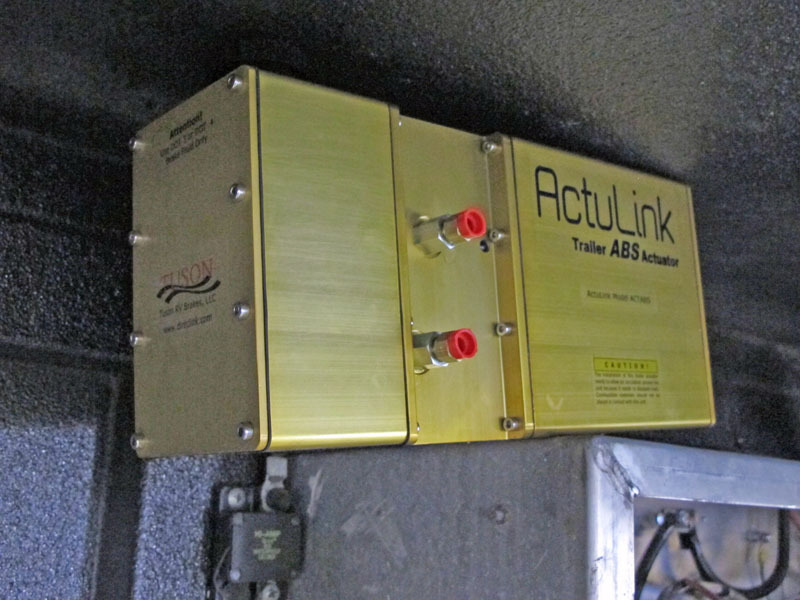 When testing with ABS, ActuLink Module lets oil flow thru it until it senses a wheel slowing down almost to lock up and then releases pressure to each individual wheel as they speed up. The module monitors each wheel’s speed thousands of times per second. With Prodigy which didn’t have ABS had to be adjusted to the right gain to not lockup the tires. We used the most efficient gain setting for right next to wheel lockup. 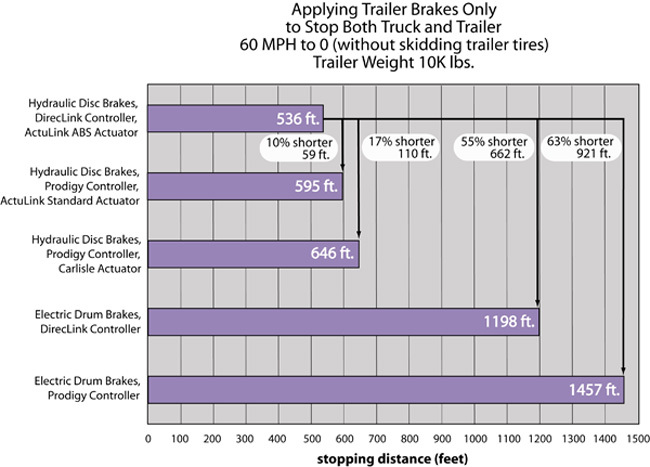 When using the trailer brakes only, the trailer brakes have to stop the truck and trailer (20,000 lbs) at a predetermined deceleration rate. This is how trailer brakes are tested in Europe. 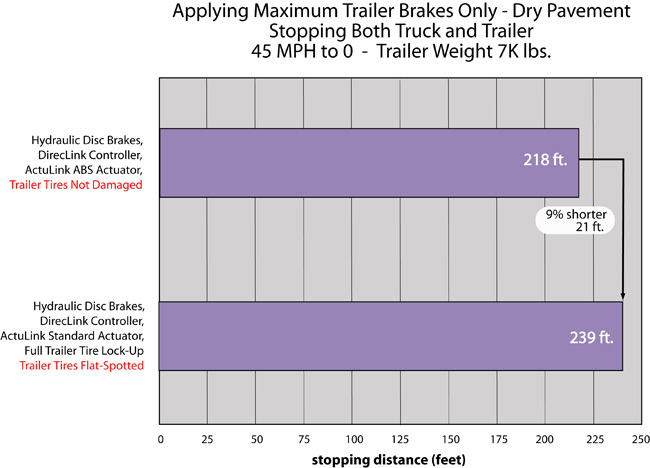 Hydraulic disc brakes with ActuLink ABS Actuator verses electric drum brakes both with DirecLink controller; The dramatic brake tests show ABS disc hydraulic over electric drum, 55% better with trailer brakes only, 662 feet shorter. 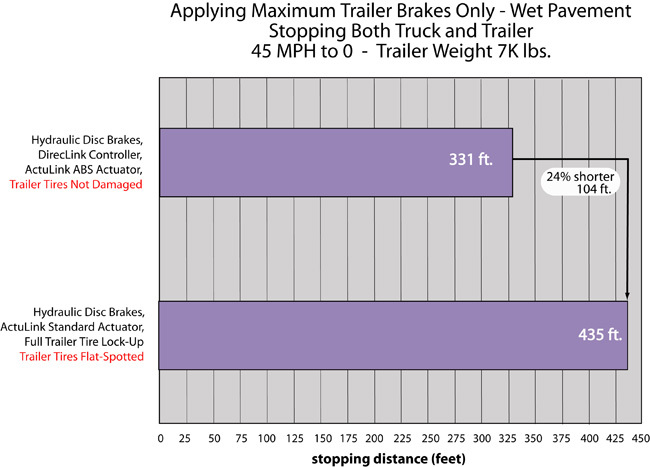 Hydraulic disc brakes with ActuLink ABS Actuator verses electric drum brakes both with DirecLink controller; The dramatic brake tests show ABS disc hydraulic over electric drum, 15% better with truck and trailer brakes adjusted to not lockup with best braking pressure, 39 feet shorter. DirecLink controller verses Prodigy controller with electric drum brakes, trailer only; DirecLink was 18% better and 259 feet shorter. Our first series of tests is with the brake controller only. 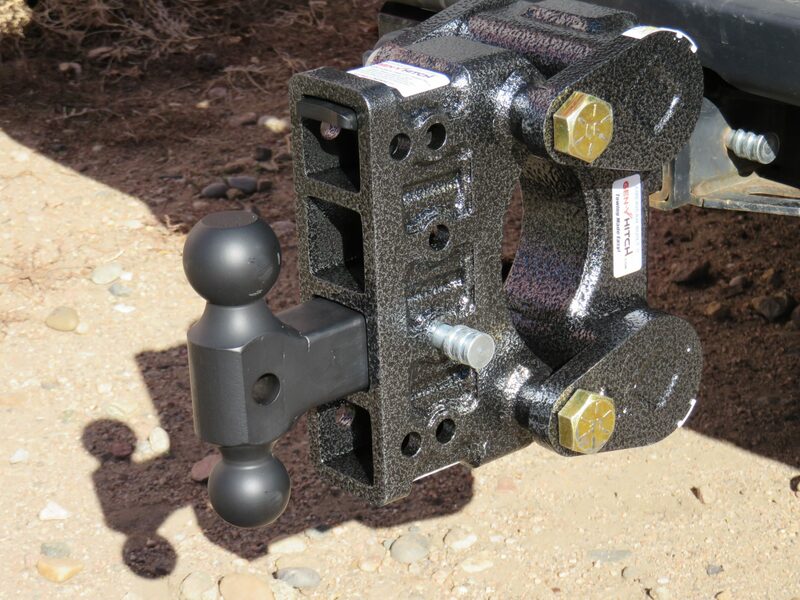 This makes the trailer brakes do all the work with no discrepancy between whether the truck or the trailer is doing more braking. When ran each series of tests for 3 or more runs and averaged the distance. 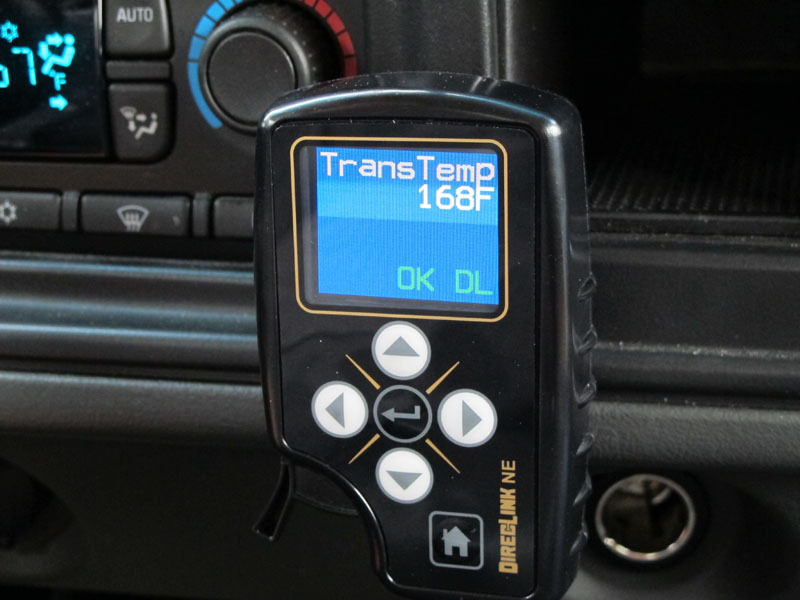 I used an external digital thermometer with laser pointer to monitor the heat of the brakes, allowing time to cool off between runs by idling the rig in low gear back to the starting position at Bandimere Speedway. We used two trailer brake controllers, DirecLink and Prodigy. DirecLink is the only controller with ABS capability. We also used two actuators, Tuson’s ActuLink with ABS and Carlisle Actuator. Thanks to Transwest Truck Trailer RV for the Road Simulator testing and use of their state of the art shop.